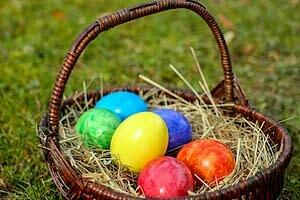 Easter is a wonderful time for families to celebrate the arrival of spring. Children and adults alike love to dress in colourful dresses and outfits and gather together for a day of springtime feasting and Easter egg hunts. It is so much fun to watch the children carrying their Easter baskets while searching through the yard, grass or even the home in search of the elusive and hidden Easter eggs, just like hunting for treasure! Unfortunately, traditional Easter eggs are dyed using potentially toxic compounds that may be harmful to your child’s health. Those plastic Easter baskets are often filled with imitation grass and sugary candies which can be harmful to both the environment and your child. Are Chemical Dyes Bad For You? Although we do not eat the shells of dyed eggs, the shells are permeable and the dyes can leach into the edible part of the egg. Many of the dyes commonly found in Easter egg dye may contain toxic compounds which may impact health, as well as alter the behaviour of a young child. Artificial colorings are either petroleum based or made synthetically. According to the Center for Science in the Public Interest (CSPI) food dyes that are commonly found in many foods, including Easter egg dyes, have the potential to increase hyperactivity in children. 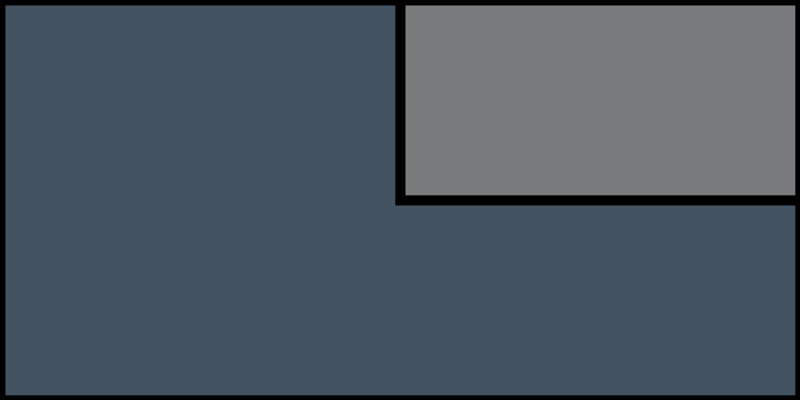 The CSPI has petitioned the FDA to put a ban on artificial food colours, however, the FDA has approved nine artificial dyes at this time. In an article by the Environmental Health Perspective, Red 40, Yellow 5, and Yellow 6 contain benzidene, a human and animal carcinogen. These are very common dyes used in the food industry, and the FDA has deemed them safe at low levels. Regardless of whether these artificial colours, agents and dyes have been approved safe at low levels, there are so many natural alternatives to use that pose no risk. Here’s a few you might like to try yourself! 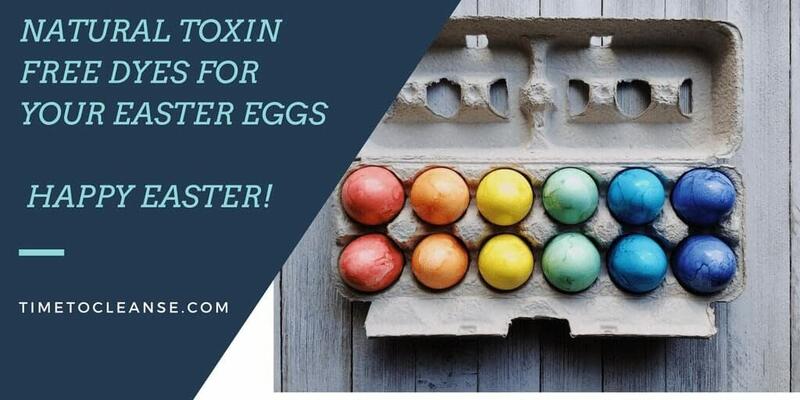 Why not avoid all of those risky chemicals and use natural dyes from fruits and vegetables to dye your family’s Easter eggs? The results can be beautiful, and you can feel good about not adding toxins to your children’s health. 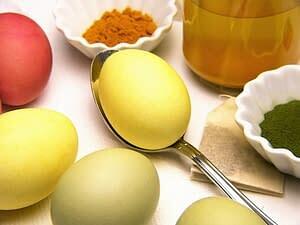 Gathering the kids around to participate in dyeing the eggs with natural colours, can be a really fun family affair. The kids become involved in learning the color attributes of certain plants, vegetables and herbs and have the opportunity to collect the plant-based sources and prepare them for the dying process. This can be a fabulous activity for the entire family. To make the natural dyes, the process is basically the same. Whether you are looking for subtle yellow colours, vibrant blues or deep purple colours to brighten your Easter eggs, you will want to start with about 4 cups of water, 2 Tbsp of white vinegar and your plant source for each color. Simply add the plants, fruits or herbs described below, boil for 30-60 minutes, strain, cool, and soak the cooked eggs in the solution until the desired color is achieved. Green: Boil water with a hand full of spinach or other greens and/or a few teaspoons of spirulina. Browns: Have fun with this one! You can use onion skins for a beautiful range of browns. Boil skins from 6 red onions for about 45 minutes to achieve the desired color. Soak the hard-boiled eggs in the strained solution for 12 hours for a nice dark hue, or use coffee for a dark brown. Lavender: Use 1 cup of grape juice. Blues: Cut up chunks of red cabbage. Purple: Boil red cabbage overnight and strain after 12 hours. Another great option for fanciful Easter eggs besides dying them is to take lovely organic white eggs, hard boil them and then get creative with hand-painted designs. You can paint flowers, birds, imaginative characters or any other design that you would like. This is a great way to let the kids be creative and have fun. Or you can take beautiful hard-boiled brown eggs and wrap them with feathers, dried flowers or lovely little twigs with natural hemp twine. Instead of using cheap plastic Easter baskets with fake grass in them, why not find a woven basket and place shredded paper or forest floor materials inside. 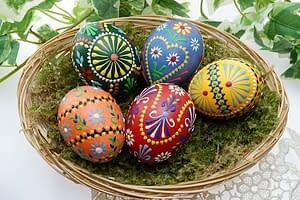 Place the natural dyed, hand-painted or hand-crafted eggs inside. Instead of sugary candies, place coconut date rolls, packets of nuts or dark chocolate for tasty treats. Or take a ceramic flower pot and fill it with little gardening tools and packets of seeds along with your Easter eggs to encourage your child to garden and play in nature. However you wish to celebrate the wonderful time of spring and Easter, make the celebration toxin, plastic and sugar-free.